In 2011, the first wave of the 76 million Baby Boomers will reach age 65, and one in three American adults will be senior citizens. Everyone wants to know how to live the healthiest and longest life. 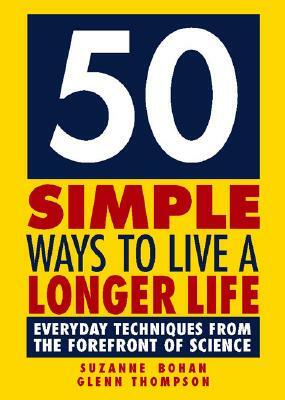 50 Simple Ways to Live a Longer Life is an easy-to-comprehend resource packed with the most amazing health discoveries from the forefront of science. It leaves readers inspired to take active roles in extending their own lives and improving their own health. Each chapter contains a different way to extend your life, plus a "Making It Real" section that tells readers what they specifically can do to achieve these benefits. 50 Simple Ways to Live a Longer Life offers fresh perspectives and intriguing information, even on those frequently covered topics like exercise and diet. This book is an affordable, easy-to-assimilate book that will help people add years and vigor to their life. Suzanne Bohan is an experienced health and science journalist. She serves as a correspondent for the Sacramento Bee and worked as a health reporter for ANG Newspapers. She's also contributed to the San Francisco Chronicle, San Jose Mercury News, and National Public Radio's San Francisco affiliate, KQED. She's won several journalism awards, most recently the 2005 David Perlman Award for Excellence in Medical Journalism. Bohan earned a master's degree in journalism from Stanford University and a bachelor's degree in biology from San Francisco State University. Glenn Thompson, a graduate of the University of Michigan School of Business, received his law degree from Santa Clara University. He practiced law for two decades while owning and operating radio stations. He's also a devoted student of health and longevity, and has served as a health advocate. Publishing a book about simple ways people can extend their lives has been a goal for more than a decade. The authors are married and live in Mill Valley, California.